When you’re enjoying a long, busy day at Animal Kingdom, a nice and easy meal is just what you need! Flame Tree Barbeque is my favorite quick serve restaurant in the park. There are so many great things about this spot. Here are five things that I think you will love about Flame Tree. Quick serve restaurants around the parks are great, but they have one major downfall: most of them never have enough seating. This is not the case at Flame Tree. Flame Tree Barbeque doesn’t have an inside at all, but the seating extends way behind the food station. There are many large gazebos that hold tables and condiment stations. These gazebos are colorful and decorated in typical Animal Kingdom fashion, woodcarvings and hidden details galore. They are all very convenient and I’ve never had an issue finding a place to eat at Flame Tree. Flame Tree is also conveniently out of the way of most craziness in Animal Kingdom. This quick serve place is centrally located, which means you don’t have to cross over into Asia or Africa to get to it, it’s right on Discovery Island. Flame Tree is an easy walk from DinoLand and right across from shops and fun kiosks. Flame Tree is secluded from the rest of the park enough to make it feel like a bit of a breath of fresh air, but still central enough to be an easy quick serve. This quick serve stop also has an awesome menu. 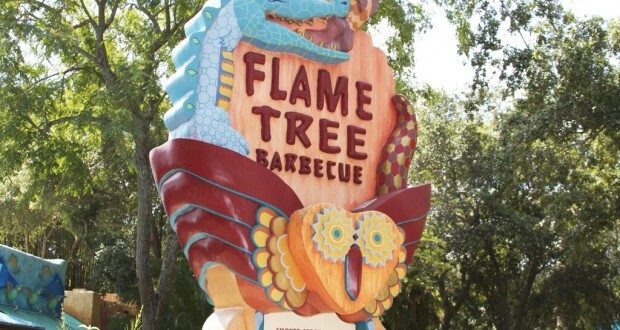 Appropriate to its name, Flame Tree has really great and fun barbeque, something different than other places in the park. My dad loves the pulled pork sandwich and I’m a big fan of the ribs. And you can never go wrong with onion rings. This menu is great for a bit of switch without breaking the bank. All of the food is nice and you pay for it, but nothing on the menu is more than $16 (and that’s for a combo meal). While this menu isn’t super extensive or adventurous, it’s a great option for quick serve and worth a stop! Flame Tree Barbeque provides the best views in all of Animal Kingdom, in my opinion. We’ve already established that it has awesome seating, but the views make it even better. Most of the colorful seating gazebos are right on the shores of Discovery River. Directly across the river is Mount Everest in all its glory. It’s super fun to watch the train climb to its peak and hear the screams and laughs from the explorers. My family loves to watch the turtles that call Discovery River their home. There is plenty of wildlife and adventure to spy while eating at Flame Tree and it’s all gorgeous.